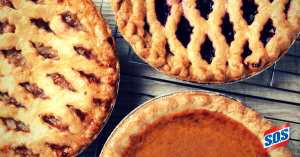 10 Fun Facts About… Pie! ⇒ Apple pie may seem as American as it gets, but in fact, the first recorded apple pie recipe dates back to 1381 and was written in England. ⇒ The term “as easy as pie” however, is an American expression. In the 1890’s, “pie” was a common slang expression meaning anything easy, a cinch… and the expression “easy as pie” stemmed from that. ⇒ If you’re the type of person who savors pie crust even more than the filling, be happy you live in modern times. Originally, a pie’s shell was intended simply to store and serve what was inside and was later thrown away. ⇒ Why wait until dessert? In the 19th century, fruit pies were a popular breakfast item. ⇒ About $700 million in pies are sold in grocery stores every year. This does not include restaurants, food service or price clubs … only grocery stores. ⇒ 1 in 5 Americans who eat pie has claimed to have eaten an entire pie by themselves. ⇒ The World’s Largest Pumpkin Pie was made in New Bremen, Ohio on September 25, 2010, and was 20 feet in diameter and weighed 3,699 pounds. ⇒ According to a recent survey, pumpkin pie is America’s favorite pie flavor, followed by pecan, apple, and sweet potato. Stargazy pie – a Cornish dish made of baked pilchards or sardines, eggs, and potatoes. 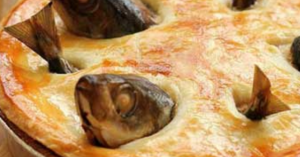 The unique feature of a stargazy pie are the fish heads protruding through the crust such that they appear to be looking skyward. Whether you prefer your pie filled with fruit, custard, vegetables or meat, there’s almost certainly a recipe to fit your taste – and February is the perfect time to find it. Go and bake with confidence knowing that for every recipe and every dish, S.O.S® is are there to help make clean up a snap. 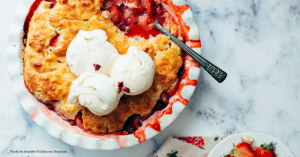 We can’t help you create the perfect from-scratch pie crust (or help you pronounce Fleischkeukle correctly), but we can take the elbow grease out of scrubbing your pie plates, leaving you more time to sit down and enjoy your favorite slice. What’s your favorite pie? Let us know in the comments below or on the S.O.S Facebook page. And don’t forget to follow us on Facebook, Twitter, Pinterest and Instagram too! 17 Responses to 10 Fun Facts About… Pie! I just made a coconut cream pie today…. I call it my MIle High Coconut Cream Pie with whipped cream topping instead of meringue. Pile it on high and sprinke toasted coconut on top. CHESS PIE THEN PECAN PIE is second favorite. 1.Apple ,2.chocolate cream, 3.pumpkin, 4. Berry pie I’m making this for Superbowl sunday,5.keylime. I really enjoy cherry, but a close favorite is chocolate pudding, followed by banana cream. Delectable! Today I made a cherry blueberry fusion pie. It was just a tad tart and lipsmacking good. #1 rhubarb pie, #2 lemon meringue, #3 black raspberry, and then from there it’s wise open – fruit pies, custards, meat, vegetable, and etc. Fun article! Your reference to Cornish Pastry should omit the “r” in Pastry. (ie. Cornish Pasty) Pasties (meat pasty) are very popular in the Upper Peninsula of Michigan, adapted by the Finnish there,originating in Britain, Cornwall. It seems most countries have a version of some kind of meat pie. Shouldn’t March be considered pie month and not any other month? March does have 3.14. Strawberry/Rhubarb custard, berries (raspberry,cherry,BlackBerry, blueberry baked together) called Razzelberry! I like blue berry pie and custard pie pumpkin pie chocolate pie lemon pie and apple pie raspberry pie. Sweet Potato pie and lemon pie plus blueberry. Those are my favorites.